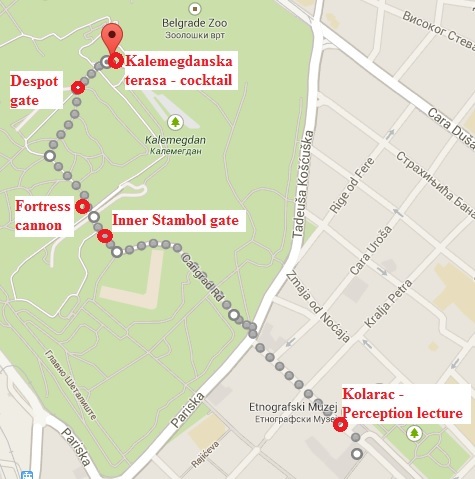 Following the Perception Lecture in Kolarac we will have an opening reception at the Belgrade fortress in restaurant Kalimegdanska terasa. It is a short walk away (less than 10 minutes) and you will be assisted by our volunteers. 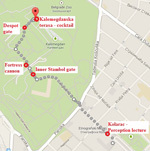 Those who are not prepared to walk through the Fortreess, now turned into a park, will be bussed to the location. Everyone who has registered is welcomed. Please wear your name badge when entering. We will serve beverages and different kinds of typical Serbian food (canapé style). This year’s conference banquet will be held at Belgrade Lake. This is “beach of Belgrade” where apart from daily activities, numerous cafes, bars and restaurants offer a rich night life. Parties, with DJ’s and/ or live music continue till early morning hours, which happen to be exceptionally pleasant on the Lake banks. On the lake there is a peninsula Ada, with the big park. Peninsula offer facilities for many different sports (football, basketball, tennis, bicycle paths, jogging and so forth). Restaurant Jezero is located on the entrance of the Ada. If you haven’t already booked your tickets for the banquet we suggest you do so quickly as places are limited. The lake and banquet restaurant are easy to get to by public transport and taxi and there will be a free transfer from the conference venue. Here is a link to the location of the restaurant. To book tickets just log into your account via the “Register Now” button and select the “Additional Options” tab. Tickets are €45 per person. Tiziano Agostini would like to invite you to join him on the Triest-Belgrade bike ride called "Cycling with Tom" - ECVP 2014. The ride will be divided into 5 stages of approximately 135 km per day. If you are interested in taking part, Tiziano can be contacted at agostini@units.it and he will be delighted to provide you with all the details of the ride.